@adamlambert will be honored by Nile Rodgers’ We Are Family Foundation with the Unity Award on January 31, 2013 at the Hammerstein Ballroom in New York City. The Unity Award is presented to artists who are “spreading peaceful messages through music.” Even though this foundation was created in 2001 as a response to the tragic events of September 11th, this will be only the second Unity Award given. The first went to Kool & the Gang in 2009. Adam will be performing later in the evening, along with Nile Rodgers & Chic, and special guests Taylor Dayne, Grandmaster Melle Mel, Kathy Sledge and Russell Peters. Rosie Perez and Touré will be hosting. The evening will include dinner and a live auction to benefit the We Are Family Foundation. We know from Nile’s tweets how impressed he was with Adam while they were working on Trespassing. It’s gratifying as a fan to see how deep this impression was. But on the funny side, I have to smirk a little when I think about the message that Adam’s music spreads. Somehow, after spending an evening jumping and thumping to Adam’s live shows, peace is not what comes to mind when I think about my accelerated cardio vascular rate! But good on you Adam Lambert for getting that peaceful message to those who can really recognize it! 🙂 KIDDING!! But it certainly is appropriate that he receives a Unity Award, considering how many of US that he’s brought together! I am also very excited to see Adam getting recognized for efforts and by groups which are not lifestyle-centric. Sting and Trudie Styler were originally slated as Guests of Honor, but had to bow out because they will be on the west coast attending the memorial of a very close friend and colleague. They will be honored at a second engagement in April in New York. Concert-only tickets are available here for $100, of which $50 is tax deductible. The announcement calls for “chic & hip attire.” I’m sure all Glamberts can meet that request with no problem!! So, who’s headed to the east coast? Congrats to Adam for this award. I hope he has fun jamming with Niles. I love that guy. I wish Adam would get recognition for more of these things than his tweets. One little tweet about a movie or artist and the whole world knows about it. Always the negative. I’m glad to hear about this. Still waiting to hear about more concerts in America or singing with Queen. Yes I too am waiting for more concerts in America! 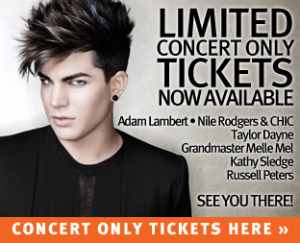 I live in Canada BUT would do everything I could to go & see Adam. I did go to his show here In Vancouver, one of his first after the Idol Tour for the top 10 did that year. I also managed to meet with him at the “Meet & Greet” before the show…well my life has never been the same! I’m not sure why the amazing talent is still under the radar but I would imagine that one of the reasons is his marketing/managing team or the company representing him! I know he has switched who represents him lately…I only hope that this brings our Adam into the light…for ALL to bask in! WAY OVER DUE! It just goes to show that Adam has (as we all know) a “Special Soul” that radiates LOVE & acceptance for all. Not only in his music but also his actions! I especially appreciate his messages of acceptance of diversity, since I am a mother of a transgender child! Spreading this positive message & empowering a person to be their “TRUE SELF” is uplifting & heart felt to say the least! The words in Adam songs resinate strongly for me because they speak the truth of varying individuals just trying to get through life which is a “Gift” for all of us! The world is a extremely difficult place for anyone that does not fit a certain mold! Congrats Adam for ALL that you do today & in the future! Congratulations to Adam. If we had more Adams in the world, it would be a better place. I never meant him , wish I could, but you can tell he is such a caring indivual and stays true to himself. He needs to be recognized more in the states. People just do not know what they are missing. I still cannot stop listening to his music everyday. His powerful voice never gets tiring to my ears. I know I am rambling on, so to narrow it down, I love Adam’s voice & personality!